And A Player To Be Named Later: Is Joba Broke? Right now, the Yankees are winning at a .621 clip, slightly down from last year’s .636 winning percentage. Considering Mark Teixeira is hitting like Mark Twain, Jorge Posada has missed a bunch of time as has Curtis Granderson, A-Rod isn’t hitting like A-Rod yet, and the bullpen has been, to say it politely, unsettled—that’s not too bad. 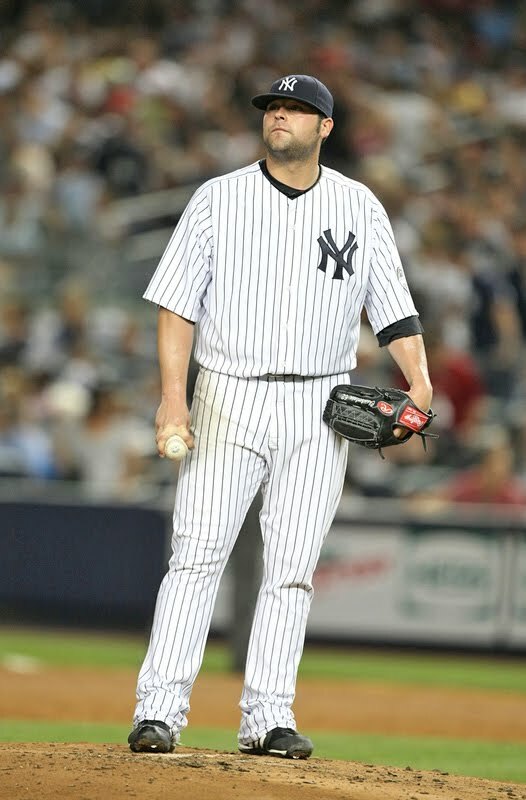 But one thing in the back of everyone’s mind, seemingly overshadowed by Teixeira’s massive slump, is Joba Chamberlain. His ERA of 5.26 belies something even more troubling. He looks unsettled on the mound, uncomfortable. He looks like a shell of the guy from 2007 and 2008. He looks broke. And that aforementioned ERA would signify that he is. But is he broke forever? Probably not. It’s a long season, and as recently as May 14th, Chamberlain’s ERA was 2.16. Since then however, he has been utterly shelled 3 times and gave up a run his last time out as well. When we compare his statistics to 2008—the last time he was a reliever full time—strangely, there doesn’t appear to be much difference between the 2 years. His velocity is the same, the movement on his pitches is on par with his past, and his first pitch strikes are the same as 2008. Also, his walk rate is lower than it’s been since 2007, as is his HR/9 number. What gives? Two telling stats are O-contact percentage and LD percentage. O-contact is described as the “percentage of times a batter makes contact with the ball when swinging at pitches thrown outside the strike zone.” And for Joba, it’s way way up this season, one of the few stats that is very disparate from his past stats. What this says is that Chamberlain isn’t hitting his spots and is leaving balls in places hitters can drive them. Joba’s Z-contact percentage—the percent of times a batter makes contact when swinging at pitches in the strike zone—is the same. So when he hits his spots, his results are the same as always—Ks, and lots of them. It’s when he misses his spots—he doesn’t miss well, and hitters hit him hard. The second telling statistic confirms this. Chamberlain’s GB/FB percentage is close to the same as they have been in the past; however his line drive percentage is way up. He’s leaving his pitches in spots where hitters can hit it. And not just hit them; but make good contact and drive them. So overall, this is just about Chamberlain hitting his spots. Which isn’t a huge, huge problem. When Chamberlain does hit his spots, he can be a tough pitcher to face. Again, less than a month ago, he had a 2.16 ERA and 21 Ks in 17 IP. He’s got a live arm and a filthy slider. And remember, Chamberlain is only 24. And young pitchers often have mechanical issues that flair up from time to time. So, right now, is Joba broke? Yes, a little bit. But it’s nothing that can’t be fixed. I wonder if Samuel Clemens had as good a glove as Tex. LOL...very funny simile P-Cat. Joba is an emotional guy and I think his problems are all in his head. a few bad outings to a short inning reliever can devastate ERA early in the season.